George Osborne vowed “to speak truth to power and wealth” at the Tory party conference this week - but dare he speak economic truth to the rest of us? 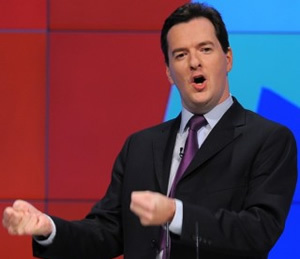 George Osborne was presumably aiming at himself and his friends, when he vowed “to speak truth to power and wealth” at the Tory party conference this week, writes Ann Pettifor, but dare he speak economic truth to the rest of us? “But this ignores the fact the UK quarter 1 figure of +0.4% followed the disastrous Q4 figure of -0.5%, compared to US Q4 growth of more than +0.5%. I don’t see where those figures (1.6% and 0.6%) are coming from. Surely the UK economy grew by 0% over the past 3 quarters (-0.5% + 0.4% + 0.1%) and the US economy by 0.925% (0.5% + 0.1% + 0.325%)? Where’s the extra 0.6% coming from in each case? “For when we compare the US and UK over the last three quarters (including Q4 2010), we find that the US grew by 1%, whilst the UK grew not at all. A difference of one per cent in favour of the US economy.